The book, which tells dieters to "be truthful about what thinness is." "One must strive to eat dangerously as one comes into the Will to Power Oneself Thin," Nietzsche wrote. "What do you fear? By this are you truly Fattened. You must embrace your Fears, as well as your Fat, and learn to Laugh as you consume them, along with Generous Portions of Simple Salad. Remember, as you stare into the lettuce, the lettuce stares also into you." 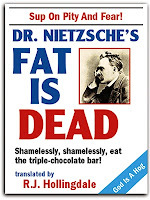 First formulated by Nietzsche, who felt lassitude and weltschmerz overcome him after a steady diet of Schopenhauer, the diet retains elements of that philosopher's "The Fruit Bowl As Will And Representation," but adds a persuasive personal challenge.